Georgia, Lithuania, Malta and Portugal are the latest Member States to be welcomed to the European Health Information Initiative (EHII) alongside new institutional members Public Health England (PHE), the European Public Health Association (EUPHA) and the Swiss Tropical and Public Health Institute, which is a WHO collaborating centre. EHII now has 21 members who attended the meeting on 22 and 23 March 2016 at UN City in Copenhagen, Denmark. The meeting was characterized by an emphasis on action with progress made on many fronts including the establishment of formal links with the European Union funded BRIDGE Consortium (Bridging Information and Data Generation for Evidence-based Health policy) and updates on joint data collection with Eurostat and the Organisation for Economic Co-operation and Development. the European action plan on evidence for policy, to be presented to the 66th Regional Committee for Europe meeting in September 2016. The health information system support tool, and the new European Health Information Gateway and accompanying mobile application were also presented. One new development at the meeting was the recommendation to begin work on establishing a burden of disease network led by PHE under the technical direction of Professor John Newton, PHE's Chief Knowledge Officer. The new network will enable countries to benefit from each other's expertise in the area of burden of disease and to safeguard a harmonized burden of disease approach across the Region. Dr Neville Calleja, Director of the Department of Health Information & Research in Malta and inaugural Chair of the Small Countries Health Information Network, said, "EHII plays a strong role in coordinating the wealth of health information activities currently underway in the Region. I can never emphasize too much the need for close collaboration between international entities, particularly for resource-strapped small states. This meeting went straight for the mark and discussed practical solutions to make this happen." A report of the meeting will follow. 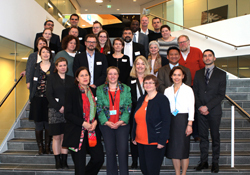 EHII is the umbrella under which all health information activities at WHO/Europe are conducted; members work together to improve the health of the people of the WHO European Region by improving the information that underpins policy.